Cents and sensibility. Once again commerce has met culture, and once again the clash has sent sparks flying. A striking sign in bright colors stands at the entrance to the Palindrome coffee bar at 131 Steuart. Owner Stan Kurz acknowledges that he was originally hesitant to use the slogan that accompanies the painting, fearing it might be misinterpreted. It has turned out, however, that during the entire six years of the sign’s existence, only one "gentleman of partial Basque descent" objected. The sign is due for a refurbishing by its creators, Back to the Drawing Board, and a new slogan: "Serious Coffee on Steuart Street." Better, but still perhaps not quite right. Too bad. The coffee is excellent. In February of 1999, as I strolled along Steuart Street just south of Mission street, I saw a brightly colored signboard on the sidewalk. I instantly recognized that the two figures on the sign had been derived from Pablo Picasso’s monumental painting entitled "Guernica." I felt deeply offended that elements from Picasso’s "Guernica" had been "borrowed" for commercial purposes: to sell coffee. To me, this painting is an allegory of the horrors of war in general, and specifically of the bombing of a small but culturally and historically important Basque town by Nazi Germans. To use the figures from Picasso’s "Guernica" in this way was, I felt, bad enough. 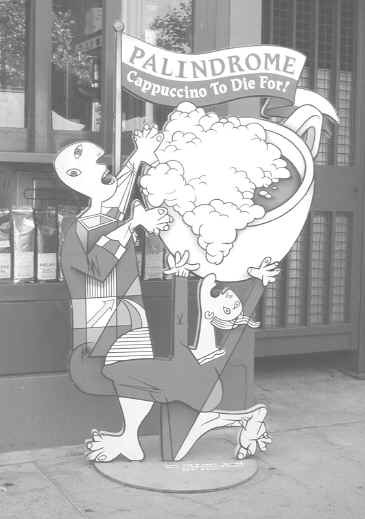 But to make light of the bombing and machine-gunning of unarmed civilians with the phrase "Cappuchino To Die For" struck me as blatant historical ignorance and cultural insensitivity of enormous proportions. The Nazis, very likely with Francisco Franco’s permission, took advantage of innocent and unarmed men, women, and children to test their new incendiary bombs, machineguns and aircraft. One year later the signboard is still there. I stopped by in April or May of this year and had a lengthy chat with Mr. Kurz while I sketched the sign in detail — he kept insisting that his signboard manifested no offense or insult toward anyone — and at one point told me that I was being overly sensitive. I replied that in matters cultural the world needs more sensitivity, and not less. I’m not culturally Basque, but I have Basque antecedents from Northern Mexico (Nueva Vizcaya), and out of love and respect for these historically notable Sonorans and Chichuahuans who are my family — and for the high regard I accord to that ancient and proud Basque culture — I cannot stand quietly in the face of this issue. When my grandparents came to this country in 1914 to avoid the revolution — and also avoid possible assassination by General Huerta’s minions — my grandfather changed his name to Fierro, in order to protect his life.